Vitamin B12 deficiency anemia is a low red blood cell count due to a lack (deficiency) of vitamin B12. 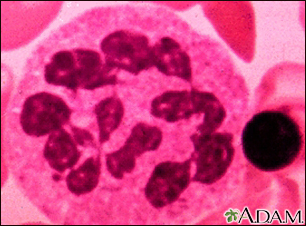 This image shows a large polymorphonuclear leukocyte (PMN) with multiple discretely-identifiable nuclear lobes. 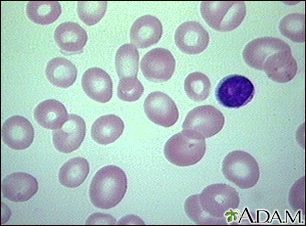 It can be seen in megaloblastic anemias. Normal PMN's have less than or equal to 5 lobes. You must eat foods that contain vitamin B12, such as meat, poultry, shellfish, eggs, fortified breakfast cereals, and dairy products. Your body must absorb enough vitamin B12. A special protein, called intrinsic factor, helps your body do this. This protein is released by cells in the stomach. You may not have symptoms. Symptoms may be mild. The health care provider will perform a physical exam. This may reveal problems with your reflexes. Treatment depends on the cause of B12 deficiency anemia. The goal of treatment is to increase your vitamin B12 level. Treatment may include a shot of vitamin B12 once a month. If you have a very low level of B12, you may need more shots in the beginning. It is possible you may need shots every month for the rest of your life. Some people may respond to treatment by taking vitamin B12 supplements by mouth. Your provider will also recommend that you eat a variety of foods. People with this type of anemia often do well with treatment. Long-term vitamin B12 deficiency can cause nerve damage. This may be permanent if you do not start treatment within 6 months of when your symptoms begin. Vitamin B12 deficiency anemia most often responds well to treatment. It will likely get better when the underlying cause of the deficiency is treated. Call your provider if you have any of the symptoms of anemia. You can prevent anemia caused by a lack of vitamin B12 by eating a well-balanced diet. Shots of vitamin B12 can prevent anemia after surgeries known to cause vitamin B12 deficiency. Early diagnosis and prompt treatment can reduce or prevent complications related to a low vitamin B12 level. Perez DL, Murray ED, Price BH. Depression and psychosis in neurological practice. In: Daroff RB, Jankovic J, Mazziotta JC, Pomeroy SL, eds. Bradley's Neurology in Clinical Practice. 7th ed. Philadelphia, PA: Elsevier; 2016:chap 10.